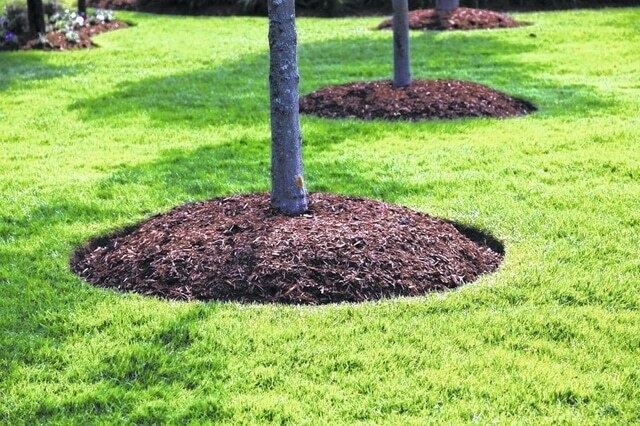 Have you ever wondered why commercial landscapes have big circles of mulch around the base of each tree? Perhaps you’ve seen big mounds of mulch around trees. Why do landscapers do this and is it a good idea? There are many reasons to mulch around trees. Mowing is easier if you don’t have to trim grass right up to the tree trunk. Making a big mulch circle around the tree keeps grass from competing with the tree for water and food. It also prevents damage from lawn mowing, a cause of many tree problems, and helps keep the root zone cool and moist. When you first plant a tree there is bare dirt where you filled around it with soil. Over time, weeds can grow or lawn grass can creep back into the bare spot. We suggest mulching right away when you plant a new tree. It looks nice and has lots of other benefits. Most people don’t realize that lawn grasses and weeds in the root zone of a tree actually compete with the tree for water and food, slowing the tree’s growth by as much as 50%. Some lawn grasses have root systems a foot deep or more, and they get first dibs on rain and fertilizer. You can double the speed of growth by simply removing this competition from the root zone, which extends out as far as the longest branch. The edge of the tree’s canopy is called the “drip line”, and established trees have roots at least that far. Damage to tree trunks is a major cause of tree death over time. Typically this happens when you mow too close and nick the bark, or skin it with a string trimmer while trying to trim the grass up close to the tree. Once you’ve opened up a wound and damaged the bark, lots of bad things can happen. Insects like bark borers and ants are attracted to tree wounds, and may set up housekeeping or lay eggs in the damaged area. Healthy bark can be replaced with scar tissue, lumps or seeping sap holes. Let’s be clear about this; we’re not in favor of “mulch volcanos”, or piling mulch around the base of the tree itself. The area where the trunk meets the soil is called the “root collar” or “root flare”, and covering this with dirt or mulch can cause the bark to rot and attract harmful insects; you should always be able to see the root flare. Before you mulch it’s a good idea to give your tree some food. We use Espoma Tree Tone, which has slow-release nitrogen and trace minerals. It also contains soil microbes (micorrizae), which restore tired soils and aid in digesting plant food. This helps the tree build a strong root system and trunk before it grows more branches, making it more likely to survive stress. You can scatter Tree Tone on the ground around the tree, or better yet use a bulb auger to make holes in the root zone and drop fertilizer into the holes. This has the added benefit of letting air into the root system, and making pockets to collect rainwater. you get it on the leaves. You’ll have to wait a week or two for the grass to die. Now, just cover it with fresh mulch about three inches thick. Pine bark mulch is best for most trees. Steve Boehme and his wife Marjorie own GoodSeed Nursery & Landscape, located at 9736 Tri-County Highway, near Winchester, Ohio. More information is available at www.goodseedfarm.com or call (937) 587-7021.